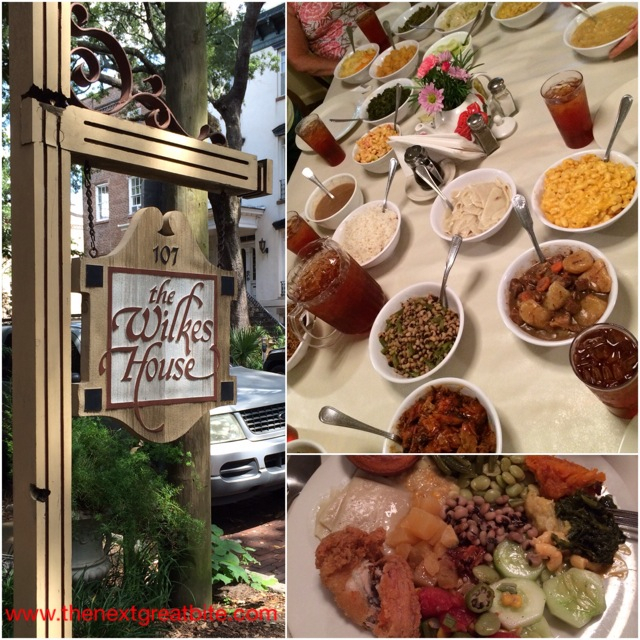 Mrs. Wilkes Dining Room always tops the list of places to try when you are in Savannah, Georgia. I had seen a segment on the Food Network years ago and had it on my list of places to try. We got there about 11:00 in the morning. It is only open from 11 am to 2 pm monday through friday. Already the line was long. As we stood in line on that hot, sunny day, the line crept along. I thought, is it really worth it to stay in line when I could be exploring Savannah and the beautiful city squares that this city is famous for? I was estimating in my head that we would probably be seated by 1:00pm; should we just get out of line and find another place to eat or should we stay? After waiting for an hour and half, we finally got seated at 12:30. We sat at a large table with others who had also waited patiently in line. At Mrs. Wilkes you sit at tables with other strangers and served family-style. Reminds me of the places in Amish country in Pennsylvania. In front of us were 24 individual bowls of different sides. I served myself small spoonfuls of everything. It was best southern cooking that I have ever had! Home-style; cooking that your grandmother would serve you. The fried chicken was crispy, juicy and delicious. The sides were heavenly. My favorites were the collard greens, the summer succatash and the sweet potato that sweetened with toasted coconut. All the vegetables were so good, fresh from the farm ingredients that highlight the summer produce season. I never had rutabega before; now I love it! The ladies that were serving us were so nice. They made sure that if you wanted more of a dish or a bowl was empty, that another full bowl is brought to the table. After you finish your meal, everyone gets up and takes their dishes to the kitchen. Just like home! So was it worth it waiting in that long line? You bet it was! It is a must when visiting Savannah. The good thing is that since it is a big meal, you have the rest of the afternoon to walk off your lunch and enjoy this beautiful city.